So I joined the Table Top Swap and the item that we are making is a set of napkins. 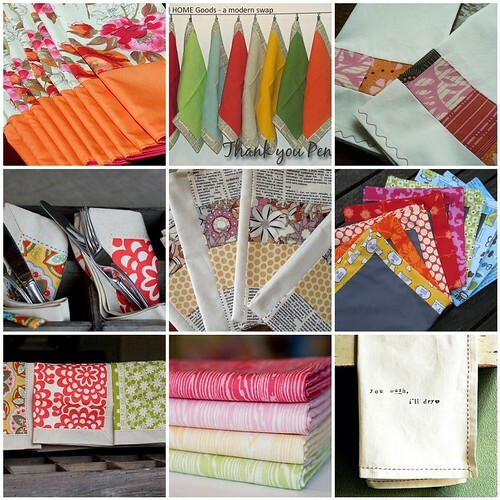 I have never made napkins before and the material of choice, linen, I had never worked with before. Let's just say it was a learning experience. 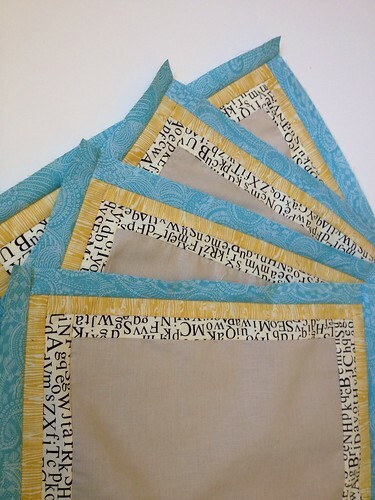 This is my partners mosaic, most notably she likes text prints, pops of color against a neutral, woodgrain, hand stitching, and is currently in love with the yellow/aqua color scheme. She also mentioned that she likes stamping, I sort of ignored that one because I have zero supplies for that so sorry partner. So this is what I have come up with so far. The fronts are done except for the hand stitching and the backs will be edged with the yellow woodgrain. So therefore I am hoping that she likes them! She has been very quiet in the discussion group so I don't know much other than the initial bit she wrote and what I got from her mosaic. I should be able to finish them by this weekend and will give an update then! Those are SO cute!!! Way to go! It is so challenging to sew for someone else. It looks like you've met most of the criteria. The napkins look lovely. I'm sure she'll love them. What a fun swap!!! Yours are coming along fabulous!! !